It has been an exhausting October. There has been a lot of movement with visitors flying in for a visit, school holidays and public holidays this month. The boys are looking forward to their 1st Halloween party next Tuesday. They will be going as ghouls. I can’t wait to hear how the party goes at their Music school. Last week as part of Mama Kat’s Writer’s Workshop I wrote about 22 Things which I never done. This week I’m posting about 22 Things that I have Done. Stayed alone and studied in Sydney and Melbourne in Australia. Gotten married at 22 yrs old. Been married for 10 years to the most wonderful guy I known. Had 3 kids via C-section. Breastfed all my 3 kids and am still breastfeeding Tiger Girl who is currently 13 months old. Taken roller blading lessons even though I’m not keen to go roller blading. Tried skiing even though I knew I rather be tobogganing. Learned how to cook and bake on my own. Learned Cantonese so that I can communicate well with R and his family. Learn how to create my own website and design my own blog. Visited Europe and can’t wait to revisit some of the places when the kids are older. 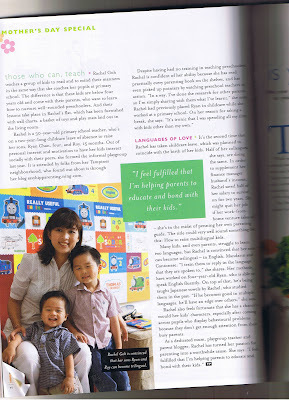 Appeared in a parents magazine with the kids on Mother’s Day Special issue. Won prizes in online contests which I took part in. Worked in four different schools and made many long lasting friendships with friends from work. Been working in the same industry since I graduated from collage. Been on NPL 3 times to take care of the kids in their formative years. Gone to music concerts with R and really enjoyed myself even though I didn’t have the faintest idea who the singers were. have had broken sleep for the past 7 years since my first born. learnt the fine art of how to multi-task with little kids around. lost 25kg and managed to fit back into my wedding dress after the birth of Doggie boy. Now I’m hoping to be able to fit back into that dress when Tiger Girl reaches 18mths old. I’ve another 7kg to my targeted weight. learned to let go and focus on what really matters rather then be distracted on the unimportant and not neccessary. Visiting from Mama Kat’s. Love the magazine pic of you and your boys. What a great keepsake! I love the way you wove the personal and professional and mothering throughout your list! And how great is that last one? Perfection (and an excellent reminder!)! You’ve done some amazing things! Plus, seven years without a full night’s sleep and still doing all that stuff? Even more amazing! I definitely don’t have #22 down yet, but hopefully I will someday! Great list! Great list. To me, it represents a very well lived life. I love that it is a mix of professional, recreational and parental items.